Charting a system of signs—a complex psychic, material, indexical portrait of a mother-child relationship—Mary Kelly's Post-Partum Document: Introduction explores the psychic and signifying processes of maternity. 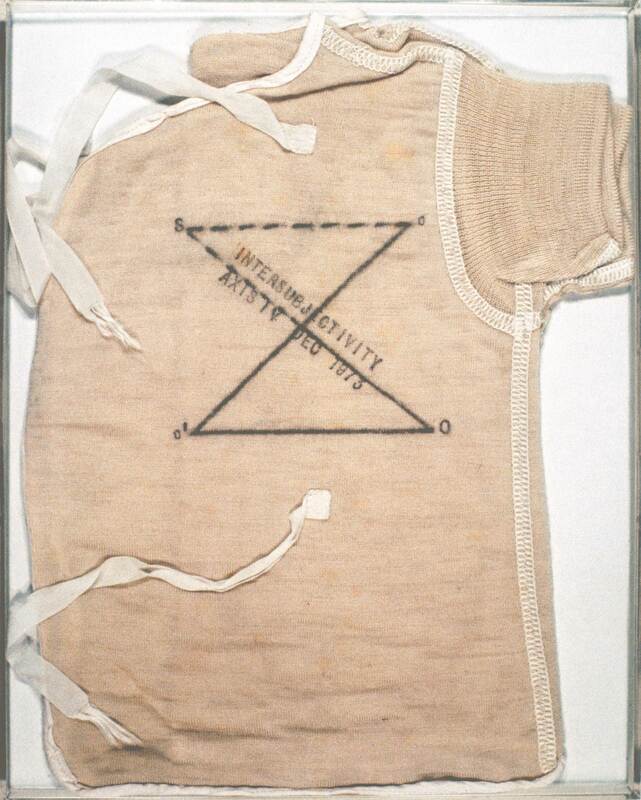 Although the affective intensity of the worn infant clothing—fetish object, index, and memorial—seems to stand in contrast to the cold mediation of the Lacanian diagram inscribed on it, these elements nonetheless refer back to each other. By disabling hard-and-fast distinctions between intellect and emotion, theory and sentiment, Kelly points to the multiple and interrelated systems through which the concept of motherhood takes shape. "Post-Partum Document: Introduction." Take It or Leave It: Institution, Image, Ideology Digital Archive. Los Angeles: Hammer Museum, 2017. https://​hammer.ucla.edu/​take-it-or-leave-it/​art/​post-partum-document-introduction/​.